Agathis microstachya (the bull kauri) was first described in 1918 by John Frederick Bailey and Cyril Tenison White. Found only in Australia, it is threatened by habitat loss. Bull kauri grows to about 50 m in height and 2.7 m diameter. The trunk is unbuttressed, straight and with little taper. Distinctive features are coarse, flaky bark, medium-sized cones with 160-210 scales, and leaves with numerous longitudinal, parallel veins. 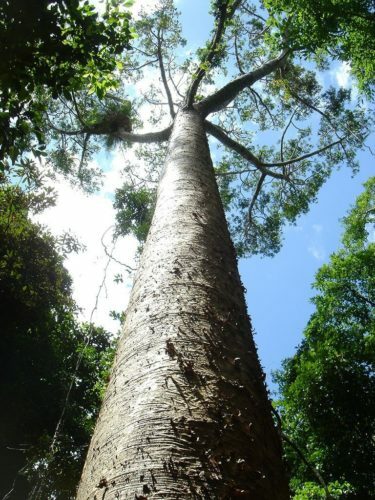 It has a very restricted distribution, being almost limited to the Atherton Tableland in Far North Queensland, with its altitudinal range 400–900 m.
The timber has an even texture, is easy to work and polishes well. The heartwood is cream to pale brown in colour. It is soft and light with a density of about 480 kg/m3 (30 lb/ft3). It is not durable in contact with the ground but can be used for house framing and flooring. Bull kauri at the Lake Barrine circuit walk, Atherton Tablelands, Queensland, Australia.